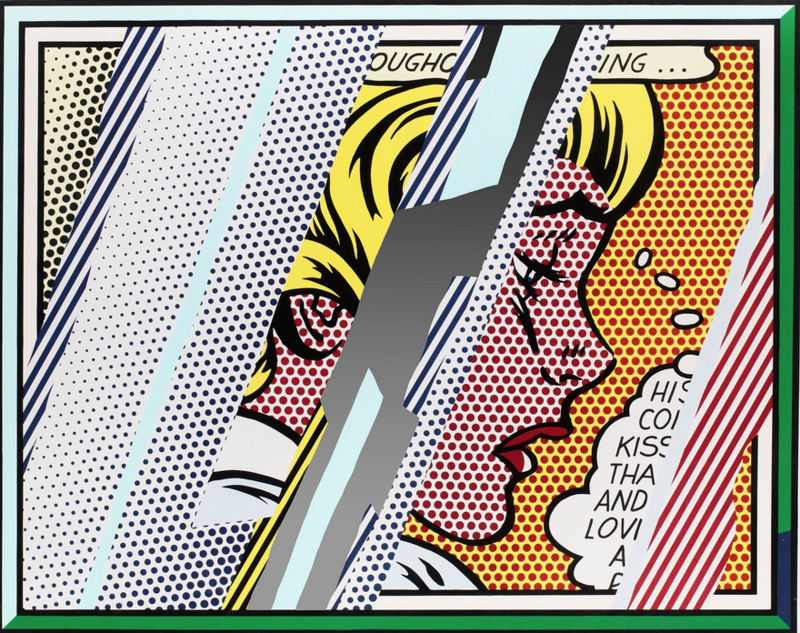 Roy Lichtenstein’s objective for his Reflections Prints series was to partially obscure the images with reflective streaks, as if behind glass or reflected by a mirror. Lichtenstein utilized gestural painting, or action painting popularized by the Abstract Expressionist movement post WWII. Though simplified in subject matter,the image represents a complex method of application evidenced through the broad use of media. Roy Lichtenstein’s objective for his Reflections Prints series was to partially obscure the images with reflective streaks, as if behind glass or reflected by a mirror. Roy Lichtenstein’s Reflections Prints are a group of seven Reflection prints which Roy Lichtenstein completed at Tyler Graphics in 1989-90. Roy Lichtensteins Reflection Prints are partly obscured by semi-abstract blocks of color and pattern, all printed and collaged to the surface of the print, which simulate reflected light, as if the image shown is behind glass or reflected in another surface. This simulated reflection is a conceit Roy Lichtenstein developed in a series of Reflections paintings he started in 1988, but has a precedent in earlier works. Roy Lichtenstein regularly paraphrases other pictures in his art, often reusing aspects of his own works, and the Reflections Prints are a typical example.